Today is my son's first day of school; it's hard to say goodbye to my boy and to our fun summer adventures. But I'm actually ready to welcome autumn and all the wonderful things that come with it: sitting by the fire, carving pumpkins, picking apples. Oh, the apples! I love them in everything. 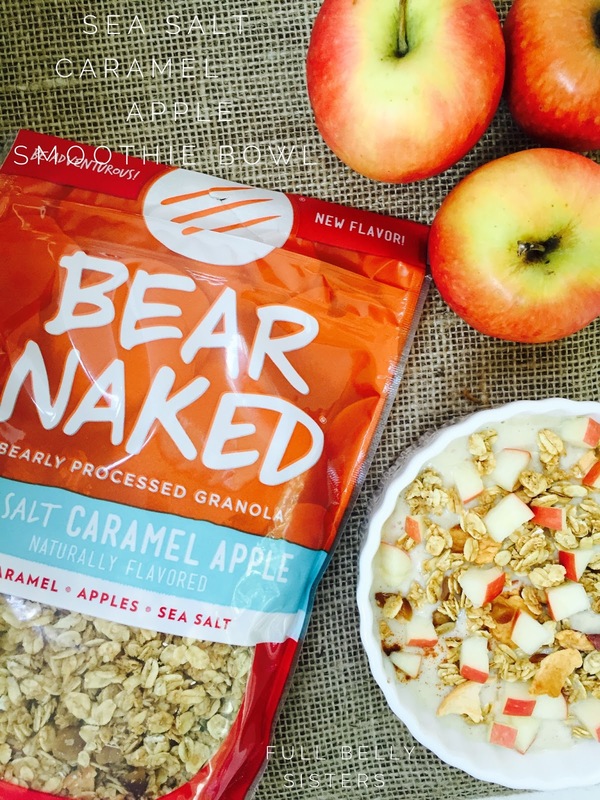 That's why the new Bear Naked Sea Salt Caramel Apple Granola is perfect for the fall season. This sweet and savory granola has an unforgettable flavor, with tart dried apples, a light caramel sweetness, plus a touch of sea salt. And I knew I had to include it in one of my favorite breakfasts: a smoothie bowl. Have you heard about smoothie bowls? Like a regular smoothie, these bowls are packed with goodness. This Sea Salt Caramel Apple Smoothie Bowl may taste like a dessert but it also a great source of protein, potassium, fiber, and calcium. But instead of sipping it, you eat it with a spoon. 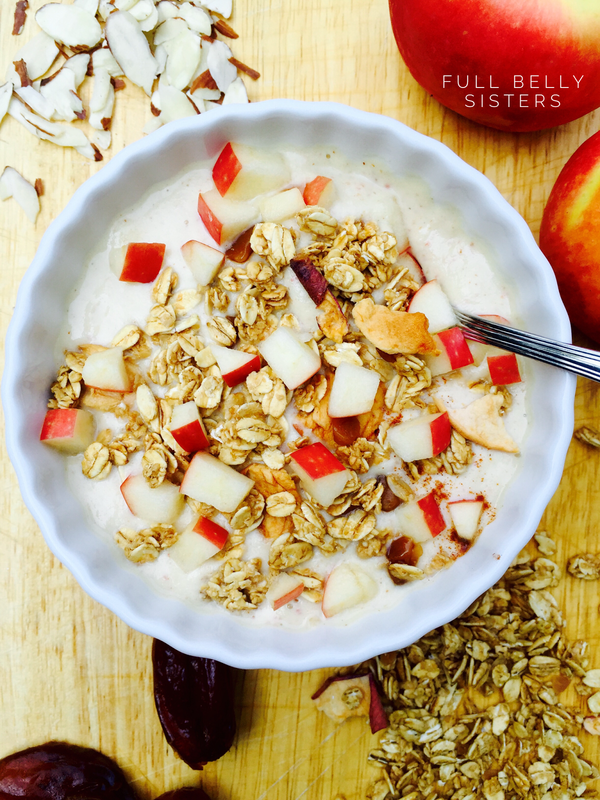 Because it's thicker and has wonderful texture from the crunchy Bear Naked granola and bits of chopped apple, this bowl feels more satisfying than a drink. It's a perfect way to fuel my daily adventures. 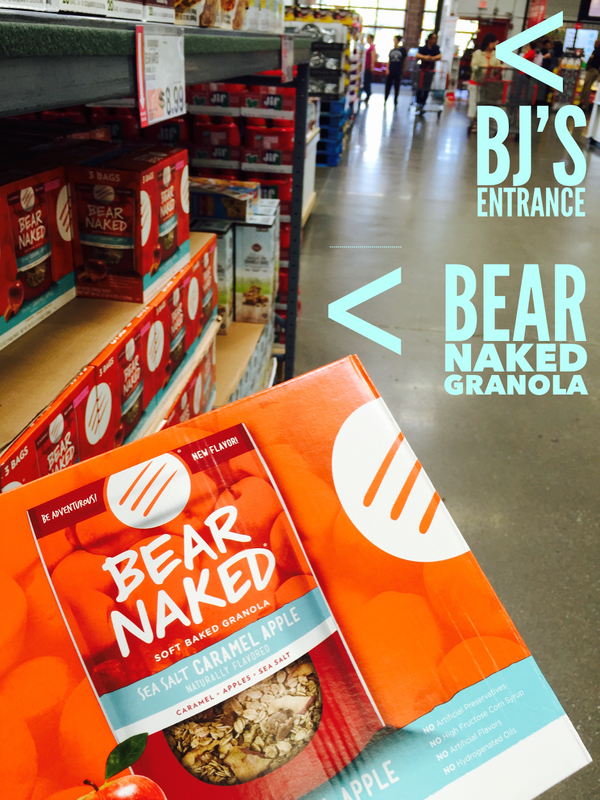 I got this amazing new flavor of Bear Naked Granola at BJ's Wholesale (so you just know you're getting a great value). It was right in the first aisle when I walked in—how easy is that? Want an even better value? Grab a BJ's in-club coupon at the front of the store for $2 off. Then get an additional $2 off coupon from Ibotta, a free mobile coupon and cashback shopping app. Yup, that's a total of $4 off this granola. Talk about value! The Ibotta coupon is right on my phone! Once I picked up the granola, I headed over to BJ's fresh produce section, where I found a five-pound bag of organic Pink Lady apples. As soon as I got home, I was ready to whip up my smoothie bowl! 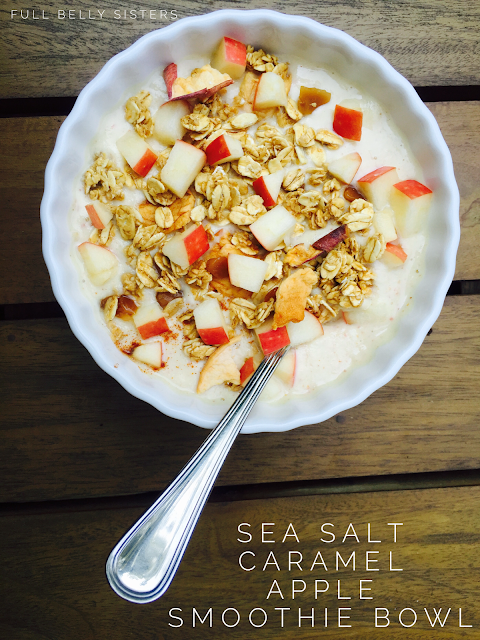 I created it to pair perfectly with the ingredients in the Bear Naked Sea Salt Caramel Apple Granola: hints of sea salt and cinnamon, apples, and dates to highlight that wonderful caramel sweetness. Put the granola in a high-powered blender and process until it turns into almost a flour texture. Add the rest of the ingredients. Blend until smooth. Spoon into a bowl. Top with the reserved, diced apple and additional Sea Salt Caramel Apple Granola. Crunchy, creamy, sweet, wholesome, and satisfying. I can't think of a better way to start my day. Are you ready to try this new flavor? Head to your local BJ's on September 5 to taste a sample of the Sea Salt Caramel Apple Granola—and don't forget to pick up a $2 off coupon at the demo! How would you eat this unique, sweet and savory granola? For breakfast, as a snack—or as part of a recipe? Check out Bear Naked on Twitter, Instagram, and YouTube. This looks fabulous! I love that Bear Granola too. Can't wait to try this combo! Justine, I really do need more ideas for healthy eating options. This looks like a great start to my day! Thanks so much, Peter, hope you like it! You just made my day, Catherine! I think I need to swap my smoothies for smoothie bowls! Love the crunchy texture from the granola and the flavors are perfect for the Fall! Looks like the perfect seasonal healthy breakfast! Love it! What a luscious combo. I could wake up to that! So healthy! 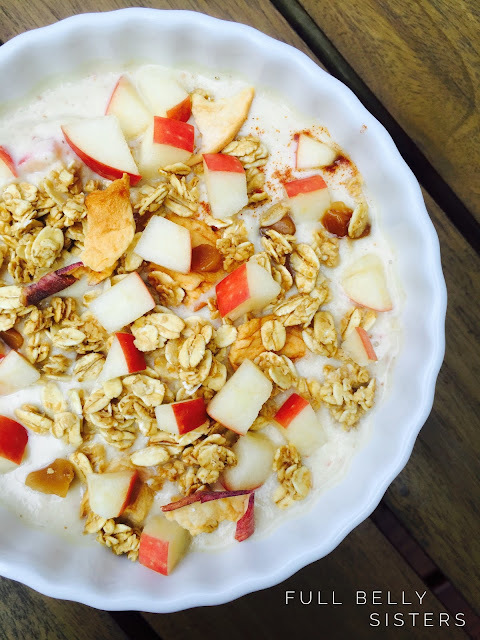 I'm so lucky that yogurts are something my kids actually love so recipes like this are for us! Great recipe! I am a big fan of yogurt for breakfast. 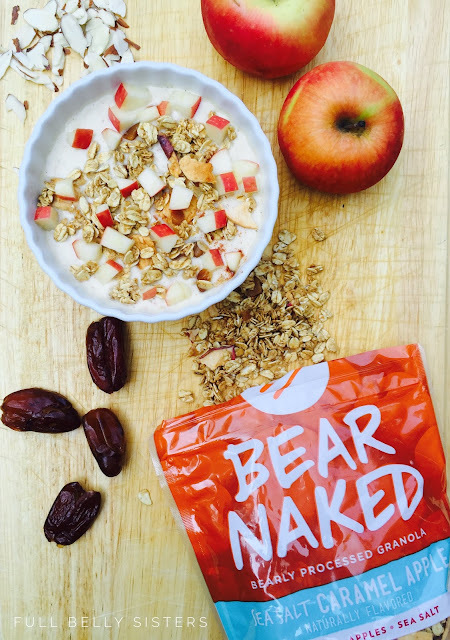 Definitely trying Bear Naked granola soon! Granola and yogurt are on e of my favorite breakfasts.I'll look for this one in the stores! I love sweet and salty flavor combos! My entire family would love this for breakfast - yum! You had me at seas salt! Love this recipe! This sounds delicious.. going to make this soon. I like this for my lunch, I love the crunchy granola with the yogurt. I love Bear Naked Granola, and this smoothie bowl looks amazing! I will definitely be giving this a try for breakfast soon! I really love Bear Naked! what an awesome application! This granola looks like the perfect snack. It looks like a very healthy breakfast choice! I am tempted to try it! Can you please post me some Bear Naked Granola to the UK? Pretty please? Smoothie bowls ROCK and yours looks awesome! I am a huge fan of Bear Naked products. This looks so delicious. I love smoothie bowls for breakfast & this one sounds amazing!! 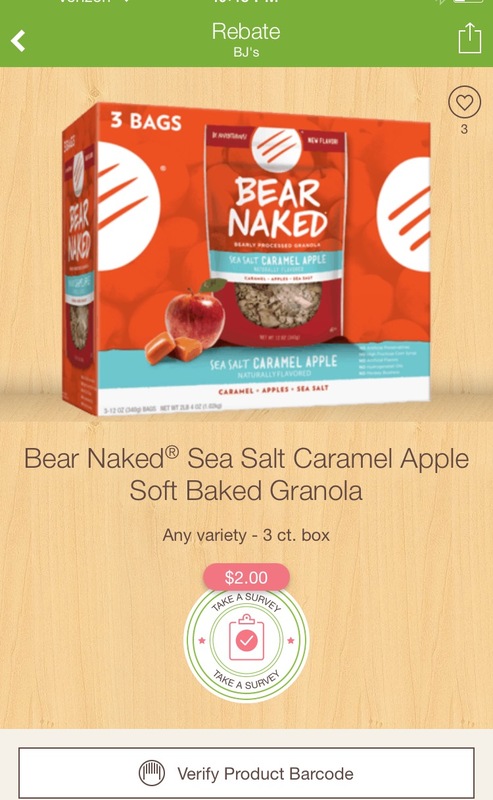 Bear Naked Granola is the best!! This looks like the prefect start to any morning! You had me at caramel apple! Wow!